Thermostatically controlled heater can heat up to 600 cubic meters of space is manufactured in the UK and supplied with a two year warranty as standard. The Broughton Blue Giant series have been designed to withstand and perform under the harshest conditions they have been designed for applications that require large scale heat delivery quickly. These units are used across the continent by the likes of AIRBUS and EDF. The range is available from 3kw to an almighty 125kw. - Is the area I am trying to heat no greater than 600 cubic meters? The Blue Giant series are black element heaters which mean that they increase the temperature of the air gradually. For this to be effective the heater needs to recirculate the heated air. If the area is too large the heater will not be able to recirculate the air before it has cooled down preventing the heater from having much impact. - Have I got a 3 phase power supply with a 5 pin socket? - Do I need the wired remote thermostat? Some applications require the unit to be installed out of reach or in a separate area. The remote thermostat allows you to control the temperature from a 10m distance. This can be made to be any distance but a 10m lead is supplied as standard. By squeezing more heat than anybody else from a 32a supply and delivering it more quietly than any other like for like heater, via up to 10m of ducting if required, the FF29 is without peer. Please do call or email for further information and prices. 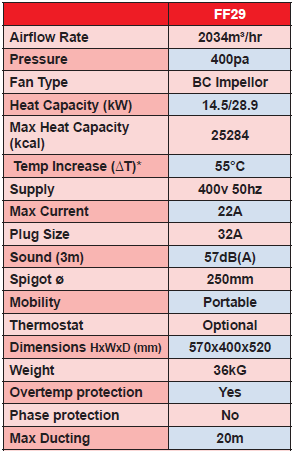 Broughton Super Giant FF42 400V 63a 3 phase 43kw portable industrial fan heater-2 yr warranty! 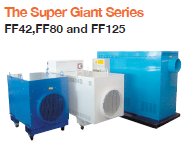 Broughton Super Giant FF125 400V 125a 3 phase 125kw portable industrial fan heater-2yr warranty!